With Thanksgiving next week you may be on the lookout for a new or different pie to make. Today I am bringing you a Brown Butter & Vanilla Pear Pie that I saw in a recent issue of Real Simple magazine that would be a wonderful addition to your dessert table. I began by browning the butter. To do so, I simply melted a stick of butter in a saucepan stirring it until it was golden and nutty smelling – trust me, it will get a nutty scent. Don’t leave it on the stove too long or your brown butter will turn to burnt butter. I poured the butter in to a large bowl and added in 5 peeled and chopped Bartlett pears, 2 peeled and chopped Granny Smith apples, flour, vanilla extract, salt and sugar. After giving this a few good stirs to mix it all together I transferred the mixture to a prepared pie dish – I had placed an unbaked piecrust in the dish. Now it was time to work on the top crust. 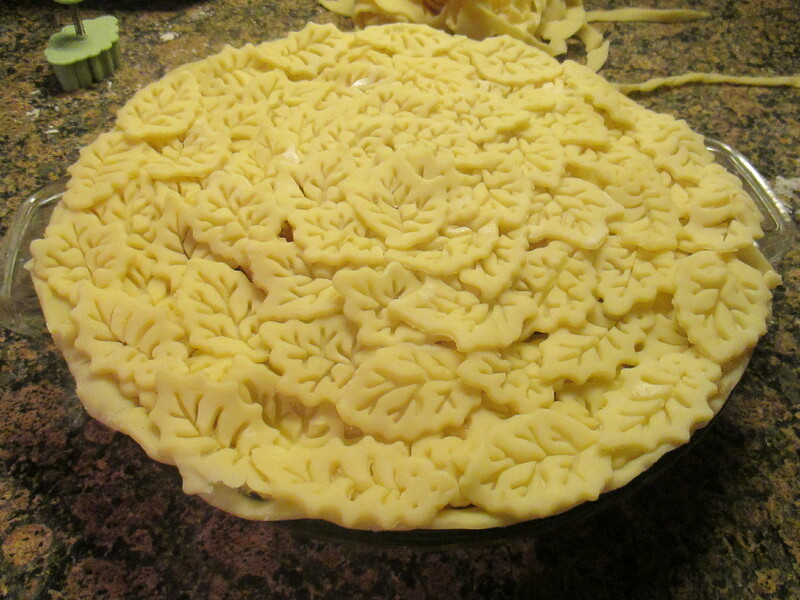 I’ve been wanting to try a different type of decorative pie crust… A leaf cut-out pie crust. 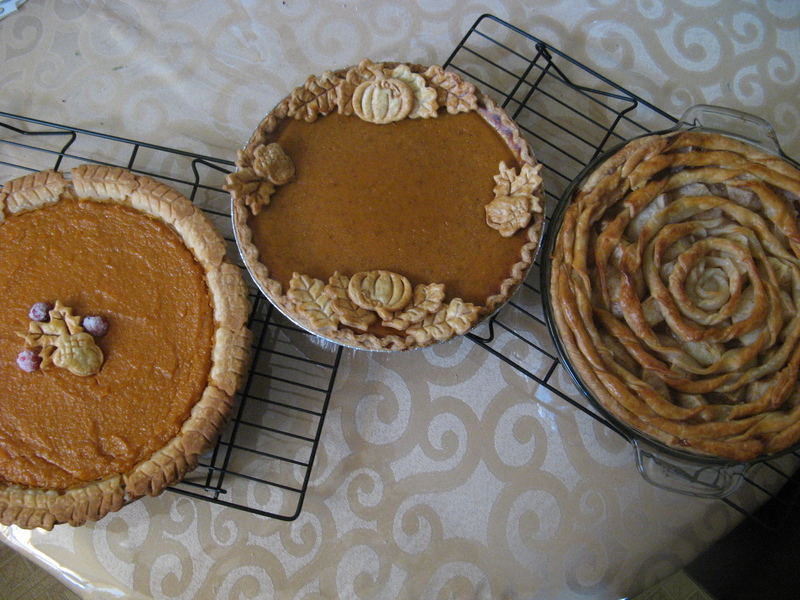 I have made cut-outs before for a pie crust, but, they have been just accent pieces. I had never completely covered the pie with cutouts. What’s nice about this… its fool-proof and looks a lot more difficult than what it is. One thing you do need though is patience! 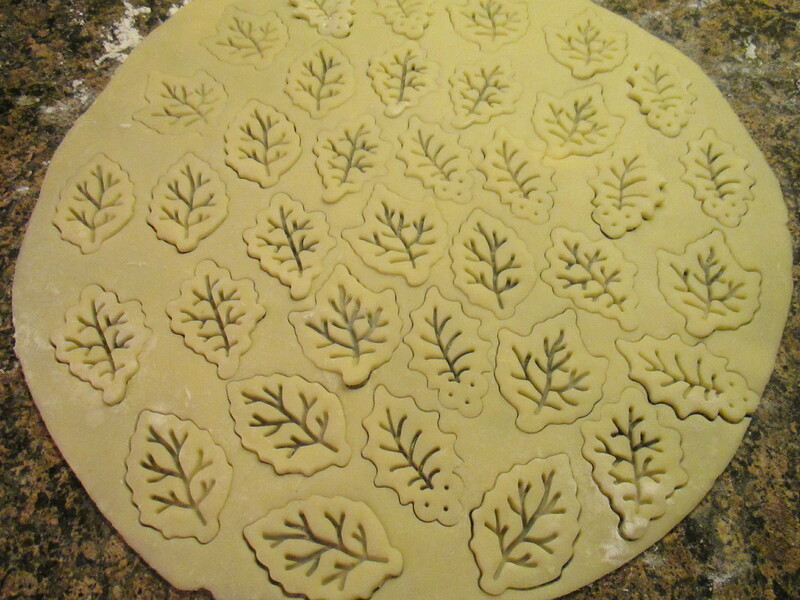 Using leaf design pie crust cutters I cut out a bunch of leaves – I had around 60. I then arranged them on the top of my pie. I brushed the pie with a beaten egg and sprinkled sugar on it and placed it in the freezer for 15 minutes. A side note, as I have mentioned before I normally use store bought pie crust – always the Pillsbury refrigerated pie crust. So, for this pie I needed 3 pie crusts; 1 for the bottom and I needed two in order to cut out enough leaves to cover my pie. I decided that next time I make a pie with cut-outs for the crust I am going to cut them out the day before and refrigerate them to save time the day of. I was concerned that the leaf design wouldn’t hold-up during baking – that it would possibly burn or some of the leave would crack. Thankfully baking the pie on the lowest rack of the oven and at a lower temperature (350 F) prevented that from happening. 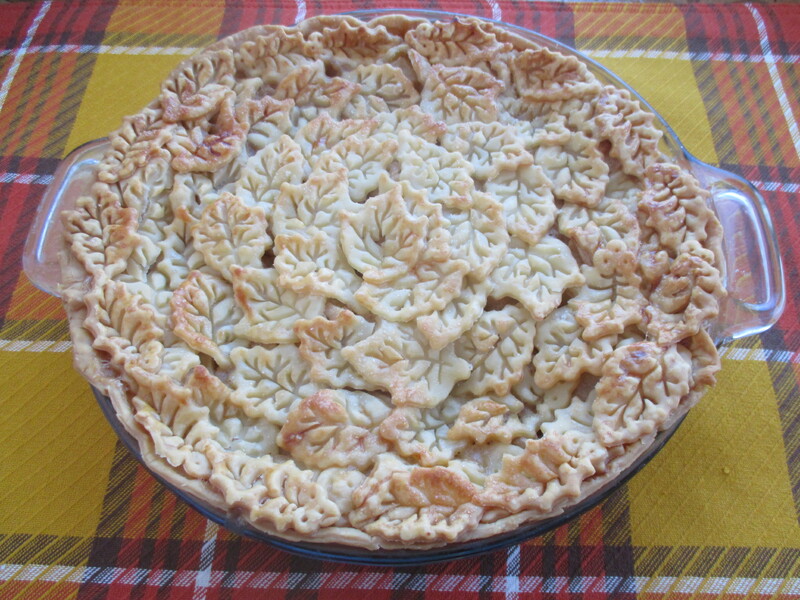 This pie is delicious… Not overly sweet and the combination of pears and apples is just perfect! Lower a rack in the oven to the lowest position and preheat the oven to 350 F.
In a medium bowl / skillet, melt the butter over medium heat stirring until golden and nutty smelling. Pour into a large bowl and let cool for a few minutes. Add the apples, pears, flour, vanilla, salt 1/4 cup sugar to the brown butter and toss. Bake on the bottom rack until the juices start bubbling, about 60 to 75 minutes. If you notice that the edges of the pie are browning too quickly cover them with aluminum foil for the remaining baking time. Let the pie cool for at least 4 hours before slicing. 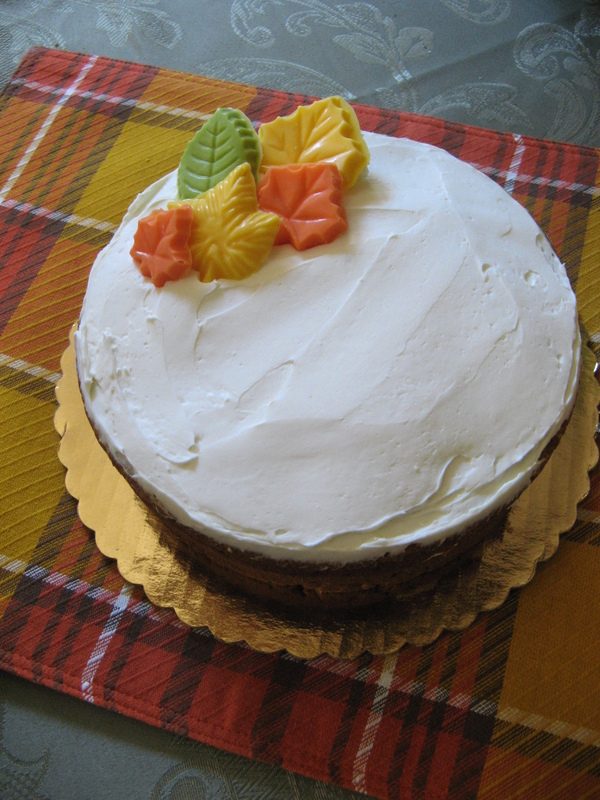 With Thanksgiving this week this Pumpkin Cake with Goat Cheese Frosting is my final pumpkin dessert of the season. I can’t say it’s the best as that title goes to the Pumpkin Tiramisu I posted about last month, but, it’s definitely a close second, and I am sure would be a welcome addition to your Thanksgiving dessert table. I actually made it for a Friendsgiving celebration I had with some wonderful friends last weekend. If you’ve never had your own Friendsgiving celebration I strongly advise you to have one next year. There’s absolutely no drama and you get to spend some time with people who are just as important or in some cases more important to you than your own family! 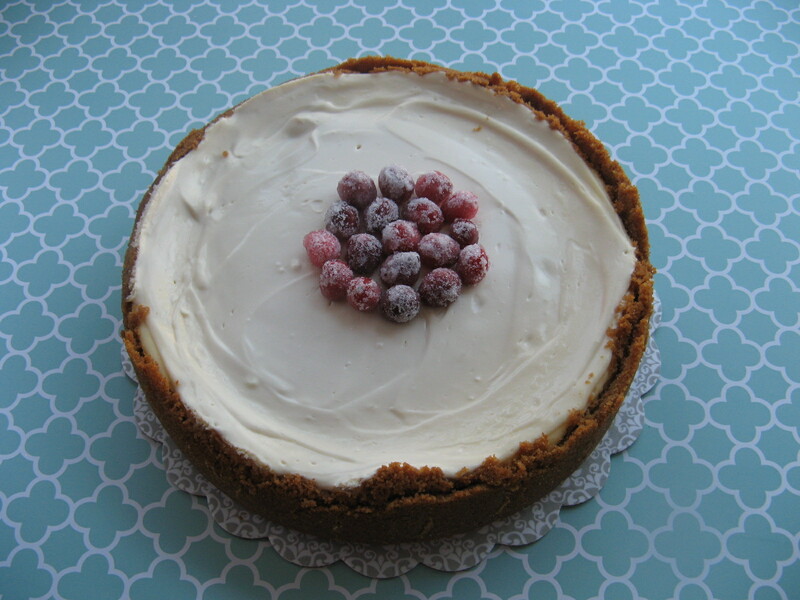 Here are some quick notes about this cake though… Definitely go with the freshly grated nutmeg and don’t try to substitute ground ginger for the freshly grated ginger, trust me, these two things make a huge difference in the flavor. I speak from experience. Make your own buttermilk by combining vinegar (or lemon juice) and milk (for this cake, I used 1/2 tablespoon of vinegar and 1/2 cup 2% milk to make the buttermilk.) And finally, if you’re not a fan of goat cheese go with a simple cream cheese frosting. You can never go wrong with cream cheese frosting. 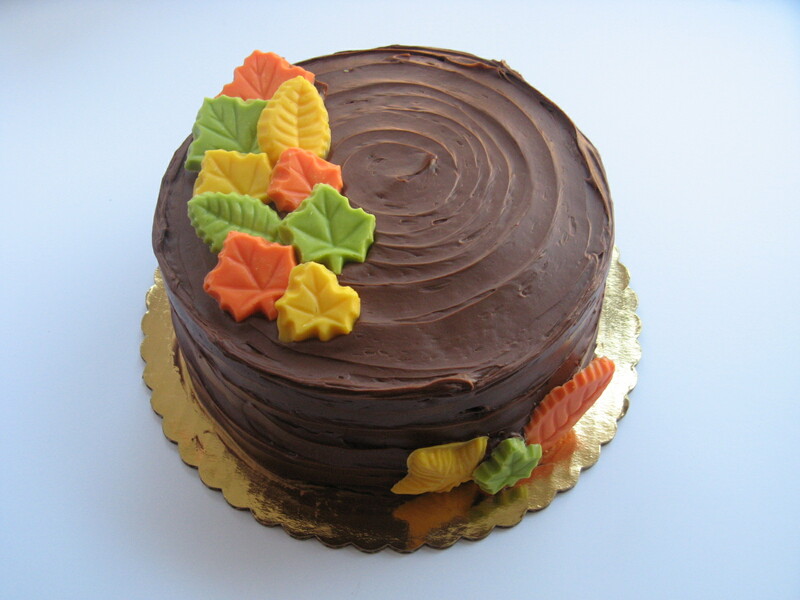 So, however you’re spending your Thanksgiving I hope it’s one with delicious food, sweet desserts and great company. And remember, no matter what has happened in life there is ALWAYS something to be grateful for! *To make your own combine 1/2 tablespoon vinegar (or lemon juice) with 1/2 cup milk – I used 2%. Let stand for 5-10 minutes at room temperature. When the milk is ready it will have thickened and you will see small curdled bits. Preheat oven to 350 F. Prep two 8-inch round pans, either by spraying them with baking spray (what I did) or brush the pans with butter, line the bottoms with parchment paper, butter the parchment paper then dust the pans with flour, tapping out the excess. In a medium bowl whisk together the flour, baking powder, baking soda, cinnamon, nutmeg and salt. With an electric mixer (or stand mixer) beat the butter and brown sugar on medium speed until pale and fluffy, 3 to 4 minutes. Beat in the eggs, 1 at a time. Then beat in the pumpkin and finally the vanilla and ginger. Reduce the speed to medium and add the flour in the batches alternating with 2 batches of the buttermilk, beating until just combined, scraping down the sides of the bowl as necessary. Divide the batter evenly between the prepared pans. Bake until the cakes are golden brown, the edges pull away from the sides of the pan and a cake tested comes out clean, about 30 -35 minutes. Transfer the pans to a wire rack to cool for 15 minutes. Turn out the cakes onto the racks to cool completely. Place the bottom layer of the cake on a cake stand (or board) and spread half of your desired frosting evenly over the cake. Top with the second layer and evenly spread the remaining frosting over the cake. Beat cheese until combined, then gradually add sugar and continue beating until smooth and creamy.